Desiree Akhavan is a film director, screenwriter and actor, best known for her 2014 feature film debut Appropriate Behavior and her role in the HBO series Girls. Desiree sat down with MUSEUM to answer some questions about her artwork and process. In a conversation with Larry McCaffery, the author David Foster Wallace said: “…it seems like the big distinction between good art and so-so art lies somewhere in the art’s heart’s purpose, the agenda of the consciousness behind the text. It’s got something to do with love. With having the discipline to talk out of the part of yourself that can love instead of the part that just wants to be loved.” How do you negotiate between creating out of the part that can love and the part that wants to be loved? The part that wants to be loved stays up late reading articles and scanning the comments for anything remotely negative so I can formulate a true sense of how unattractive my work must seem to the outside world. It is not productive. I also think that collaboration and putting my trust in others is what keeps the work coming from a place of love. In an interview with Refinery 29 you stated that your feature film Appropriate Behavior “ended up becoming slightly more ambitious” than you had originally intended. In what ways was it more ambitious? In that interview I was referring to the budget. When I had originally envisioned making my first feature I thought I’d ask all my friends to donate their time and shoot it on weekends. My producer Cecilia Frugiuele helped me widen the scope of what I thought was possible. What do you find yourself chasing, and where do you find yourself stopping and settling in? I am always chasing opportunities to make things. I only find myself stopping and settling in when loved ones force me to. For Appropriate Behavior you both wrote and directed the film; do you prefer one craft over the other? No, I don’t. I find that one job enables the other for me and I like to be involved in all stages of production and conception. Sales girl at an outlet clothing store, age 15. What impact is the surge in attention on you having on your relationship with your work? So far I haven’t felt a difference. What artists (of any medium) do you find yourself currently returning to? Who do you recommend? I’m constantly inspired by Louis CK’s show, Louie. 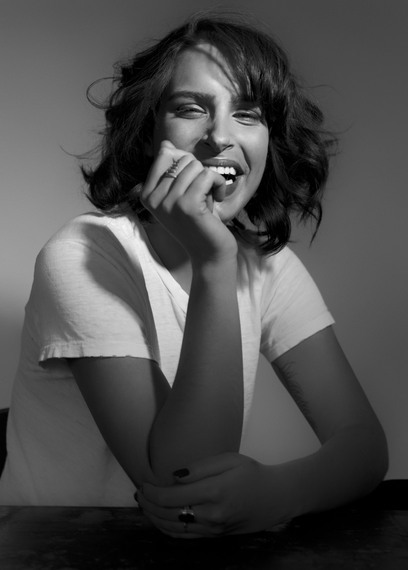 View some of Desiree Akhavan’s work here.